Anthony Vaccarello taps into the house’s archives to re-imagine the Saint Laurent party girl. Every night, for the first five minutes of every hour, the Eiffel Tower lights up in a golden hue. On Tuesday however, at the stroke of eight, the iconic column twinkled to the frenetic rhythm of a fashion week catwalk. Who times their fashion show to the lighting of the Eiffel Tower anyway? Only Saint Laurent, legendary label of the tuxedo suit for women and eternal symbol of the Parisienne style could pull this off. Under the luminous tower, in the Jardins du Trocadéro, stadium seats and a plain grey flooring formed the stripped-down backdrop to Anthony Vaccarello’s SS18 collection. If one thing, the colour palette lived up to the cliché of the all-black Parisian look. Yet sequins, feathers and pops of colour here and there reminded us of the main vibe: clubbing. After a year as creative director of the house, Vaccarello is crystallising his vision of the Saint Laurent man and woman, reviving YSL’s heritage while adding his own touch of sexiness. The party started as 14 male models strode down the catwalk in black trenches and blazers paired with equally black skinny trousers, occasionally leather ones. The fun came in small doses with a daisy print sheer shirt and a couple of colourful bomber jackets, including one covered in small butterfly embellishments. As for the girls, there was plenty of leg (read: the most perfect of pins) on show. Thigh-high shorts were matched with revealing silk and tulle blouses inspired by Yves’ jaunts to Morocco. Earrings were also invited, giant and sparkly, like the twinkling glory of the Eiffel Tower. And as if the above was not enough, Vaccarello also threw feathers in. And not few! Plumes invaded everything from the straps of sandals to the sleeves of jackets and dresses. And most fabulously, they appeared on thigh-high boots. In electrifying blue or black, thigh or calf-high, the slouchy boot that made heads turn at the AW17 show is back in a feathered version. The Belgian designer wrapped it up with cocktail dresses and pouf silhouettes, tapping into the house’s archives and showing that the Parisian girl he envisions has a few tricks up her sleeves. 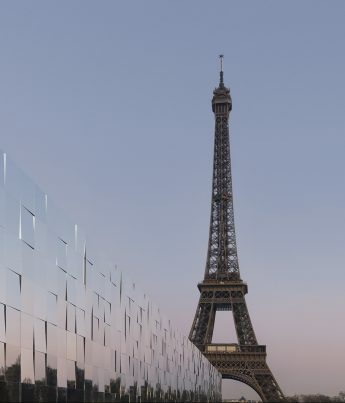 Streamed from under the Eiffel Tower, watch the Saint Laurent AW19 show live today at 7pm.